Plenty of folks love baseball, but Bill Law is dedicated to the game. As the Bulls retired PA announcer and longtime organizer of Raleigh's annual Hot Stove banquet, Bill is Mr. Baseball in the Triangle. Our League President Randy Mobley was at the ballpark last week to present Bill with the Spirit of the International League award. Well deserved! 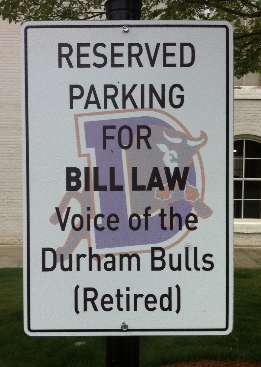 Read more about Bill's 20 years with the Bulls and his lifetime love affair with baseball. The best part of this event was surprising Bill...completely. We asked for his help with a sponsor presentation, but we turned the tables on him! His entire family - wife/children/grandkids - sneaked into the ballpark for the ceremony, and of course, an evening of baseball.